The person pictured with James Joyce is the woman who gave Ulysses to the world. 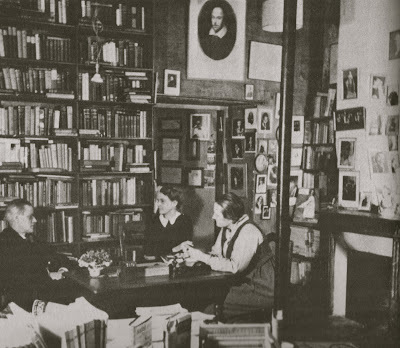 Sylvia was the founder of Shakespeare and Company, the bookstore that was the hub of literary Paris in the Twenties and Thirties. This plucky American from New Jersey had the courage to publish what was considered an obscene book when no one else would touch it. In 1921 Ulysses was deemed to be pornographic in America after portions of it were published in the literary magazine, Little Review. The legal decision made in the New York Court of Special Sessions ruled the novel "unintelligible" and "obscene" which meant that major publishers in the United States and elsewhere would not touch the manuscript for fear of prosecution. The judgment was a heavy blow for Joyce. He knew that all hope of publication in English-speaking countries would be impossible for decades. It occurred to Beach that she might help and asked Joyce if he would let Shakespeare and Company have the honour of bringing out Ulysses. Joyce accepted immediately, even though Beach had never published a book before. The next eleven months proved to be a series of crises, the first of which was the typing of the manuscript. Seven typists refused to type "Circe", one of the bawdiest chapters; the eighth threatened to throw herself out the window. The writer Robert McAlmon typed forty pages of "Penelope" when Beach could not find another typist. McAlmon had to decipher Joyce's "hen-scrawly" handwritten script with no less than four notebooks with insertions marked in blue, purple, red, yellow and green ink. For three pages McAlmon painstaking put the insertions in the right place. "After that," he wrote, "I thought Molly might just as well think this or that a page or two later, or not at all, and made the insertions where ever I happened to be typing. Years later I asked Joyce if he had noticed that I'd altered the mystic arrangement of Molly's thought, and he said that he had, but agreed with my viewpoint. Molly's thoughts were irregular in several ways at best." Sylvia Beach chose to use as her printer, Maurice Darantière, who was based in Dijon. This was a conscious choice because her French printers did not understand English words or punctuation and had no idea what the manuscript contained. Even though the project threatened to bankrupt her, Beach allowed Joyce to have as many proofs as he wanted. Time and time again, she persuaded Darantière to allow Joyce to alter his manuscript which then had to be painstakingly reset by hand. He added and added, with the final set of proofs containing more handwriting than print. And, even then, Darantière continued to receive endless telegrams with new lines to insert or delete. 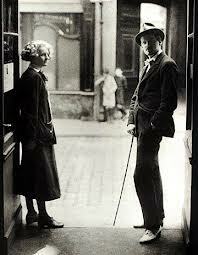 Sylvia said, "I would never have dreamed of controlling its great author so gave [Joyce] his head. It seemed natural to me that the effort and sacrifices on my part would be proportionate to the greatness of the work I was publishing." The fascinating story of the publication of what Anthony Burgess called "the greatest novel of the 20th Century" is told in an excellent biography by Noel Riley Fitch, Sylvia Beach and the Lost Generation. Highly recommended reading. Perfume of embraces all him assailed. With hungered flesh obscurely he mutely craved to adore. He wasn't adding or subtracting words, only rearranging them to have the weight and the power he wanted in search of that ever elusive thing, perfection.